Businesses are ditching paper forms for electronic ones instead, and for good reason. But should you switch to paperless forms? The era of the paper form is coming to an end. While they have not disappeared entirely, there's been a clear shift over the past few years. More and more businesses are opting to go paperless. There are plenty of benefits to going paperless, or at least reducing paper in your office. One area where you can do this is through your forms. 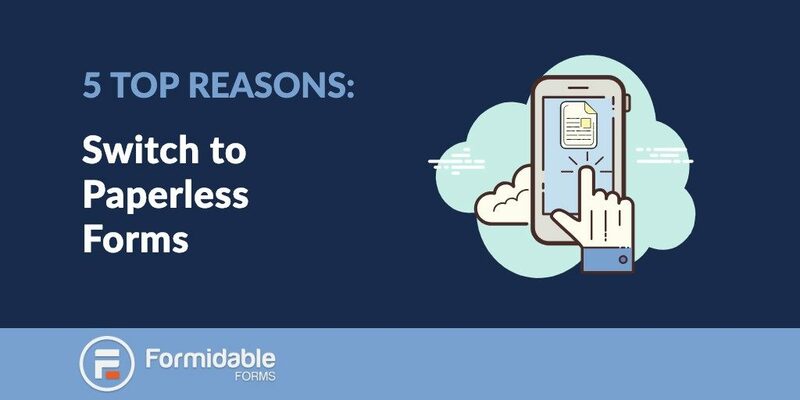 In today’s post, we’ll be going through the top reasons to switch to paperless forms for your business. Have you got tons of filing cabinets stuffed in a room with barely any space to move? It’s a familiar set up in many offices across the world. But this doesn't have to be the case. You can drastically reduce the amount of paper you hold with a digital filing system. Switching to paperless forms and making use of digital or cloud-based storage can save a lot of space. One key benefit to saving office space is that you can save some money. If you clear space where you are already, you won't have to upgrade to a bigger office or pay for extra storage space. It’ll come as no shock to hear that paper isn’t great for the environment. Think how many trees are stuck in your filing cabinets. A couple of sheets of paper here and there might not seem like much, but over time, even a small business can get through masses of paper. If you want to reduce your environmental impact, then reducing paper usage and switching to paperless forms is a great step. Saving money is always good news for a business owner. It's probably one of your favorite things to hear. One simple way to save money is to stop relying on paper forms. There are ink costs, paper costs, printer maintenance and of course the storage of all that paperwork. All of these costs can be reduced by going paperless. There’s simply no need to spend so much on printing and paper storage when modern technology allows you to do all this online. Time is money, and if you can save time, this can only be good news for your business. Sending out forms in the mail, waiting for them to be delivered, signed and then sent back to you again is so time-consuming. A simple sign-up process can take days or weeks when it should be quick and efficient. With paperless forms, all you need to do is email a form or direct a customer to a page on your website. They can fill in the form instantly. But what about getting signatures from customers? If you’re worried about collecting signatures, then take a look at our post on how to collect electronic signatures. With all that time, space and money saved, the overall effect on your business can only be beneficial. Making sign-up or feedback processes more efficient can give your company a much-needed boost of productivity. Just think what you could do with all that saved time. Perhaps you could spend it winning more clients or thinking up new ways to enhance your value. Not fully convinced about the benefits to having a contact form? Take a look at our blog post on the top benefits to your business. If you want to go ahead and build a contact or sign-up form for your website, you can easily with our drag and drop form builder. Kara Copple is a content writer who helps Formidable get their message across through informative blogs, emails and website copy. Based in England, she's also an avid reader, fiction writer and travel enthusiast. Hi Mam, really great informative article. Can we use those form into static website http://digitalsignages.co.in if it works for non WordPress Website then it's really good to make use of it. Thank you, glad you found it interesting. You can use forms on any website, but Formidable is specifically designed for WordPress websites.